The first one is not inspiring and the second one is hard to transfer on a regular girls body in everyday’s life. Despite that, oversize can actually look great on you when you know how to master it. All advices can be used separately or together. Either all at once or separately. Especially when trying to pull out the oversize total look as the lady here. You could also wear a tight perfecto jacket on yop of your oversize knit. 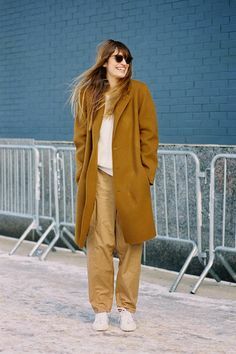 But only a model tall and thin woman (here Caroline de Maigret) can stylishly pull out the all oversize look without doing any of the 5 above mentioned tricks. – If you have large hips, avoid oversize pants that will only make them look larger. – If you are small do not go for all oversize look, you’ll be lost in it. I you go for oversize top, do not choose a long one, that will shorten you. If you go for oversize pants, wear heels. And you? Do you dare wearing oversize clothes? Hi, I‘d like to know which Brand the pink oversize Pullover from the picture „Brighton the Day“ is?